The S50 range, made by Vitra, truly does live up to the Vitra name as being one of the world leaders in bathroom design. The range encompasses everything that is contemporary, with its bold, vibrant, up to the minute design; it will, without a doubt, bring your bathroom to life. 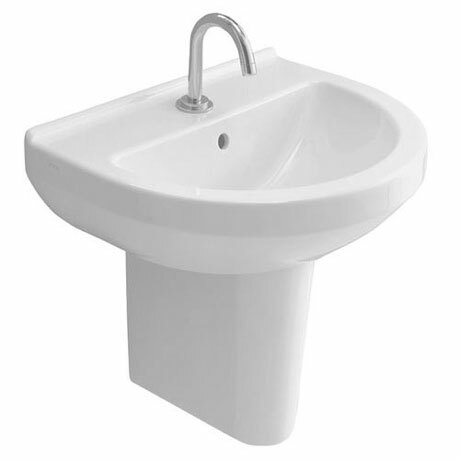 This 1 Tap Hole Round Cloakroom Basin and Half Pedestal is ideal for bathrooms where space is at a premium with its short projection of only 350mm. Available in a full or half pedestal option. Sink is small yet deep. Ideal if space is an issue. Would go for a short neck tap otherwise cannot get hands in the sink easily! As I went for normal basin taps and wish I had gone for smaller ones for thi style.